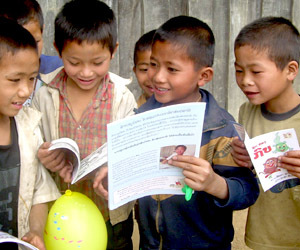 The Laos Literacy Project is a U.S. non-profit, tax-exempt organization. It was created to increase literacy in Laos among both children and adults, and to increase access in Lao villages to books and information about health, nutrition, better agricultural techniques, and other subjects that will increase the quality of life in one of the world's poorest countries. We work closely with Big Brother Mouse, a Lao-owned, Lao-based program, to create get books into rural Lao schools and villages. Big Brother Mouse is a separate organization. To see more about their activities, which we support, please go to Big Brother Mouse. Please send all inquiries about Big Brother Mouse, including requests attend a village book party, if you are a donor, to Big Brother Mouse, not to us. We are in the United States and are not involved in day-to-day operations and scheduling of Big Brother Mouse. Do you remember when you discovered the joy of reading? The power of a book to open doors to another world? Most children in Laos learn to read from a teacher with a blackboard. The school may have some shared textbooks, but many children have never seen a book. Certainly they've never owned one, and they've never had a chance to discover the fun of reading. The Laos Literacy Project works closely with the Lao-based Big Brother Mouse project, to make literacy fun for children in Laos. We provide funding for book parties in rural schools, which begin by getting students excited about reading, and end with each child getting the first book they've ever owned. Then the school gets more books, so children can trade their book for a new one after they've read it. Reading a good book is a joy in itself. But books can provide much more than enjoyment. They can provide information and inspiration to help readers improve their quality of life. We help make books available in rural schools, but we also support small, home-based libraries in villages. At these libraries, adults, young people, and children can all find information about health, nutrition, child care, agricultural techniques, sanitation, and other matters that affect them. They can find books that are simply enjoyable to read, and books that help them learn about the world. The Lao alphabet is phonetic. If you can speak Lao, it's not hard to learn the mechanics of reading it. But it takes lots of practice, with books that are enjoyable, before someone develop reading skills that let them focus on the story or content of a book, rather than on the act of reading. 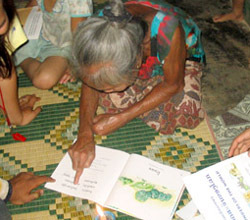 Lao people as young as six, and older than sixty, have learned to read with books from Big Brother Mouse. With your help, many more can follow in their footsteps. Deductibility for U.S. taxpayers: The Laos Literacy Project has received 501-c-3 (tax-exempt) status with the IRS. Donations are tax-deductible for U.S. taxpayers, to the extent allowed by law. Please be sure to include your full name and address for donations of $250 or more if you wish to deduct your contribution.